from 19th to 22nd July 2013. 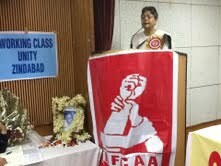 AICGWBEA Flag was hoisted by Shri. Badri Ram Jakkar, Honorable Member of Parliament. Com. 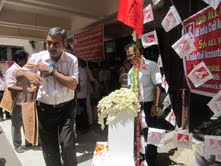 S.K.Vyas, Advisor, Confederation of Central Government Employees & Workers, New Delhi was also present in the program. 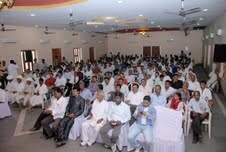 About 300 delegates and observers participated from different part of the country. Then Homage was paid to the Martyrs by all the leaders of the Confederation, delegates and other comrades. The Conference was inaugurated by Smt. Chandresh Kumari Katoch, Honorable Union Minister of Culture. The Honorable minister in her inaugural address congratulated the AICGWBEA for holding the National Conference at Jodhpur and extended best wishes for the success of the conference. The Honorable minister assured the genuine demands of the CGWB employees will be taken up with the related ministry to resolve the issues at the earliest. The Honorable minister also assured the genuine demands of the Central Government Employees will be taken care by the government. Com, S.K.Viyas, Advisor, COC described the Government attitude towards downsizing, contractisum and privatization. He also quoted in his speech about the necessity and justification of merger of 50 % DA with pay with effect from 1.1.2011 and appointment of 7th Pay commission for the central Government employees and withdrawal of PFDRA Bill. Com. R.N.Choudhry, President of AICGWBEA welcomed the Chief Guest, Guest of Honour, Leaders of Confederation and all other delegates who have come from different part of the country. Com. K.S. Madhusudhan, Secretary General elaborately described the history of the association since 1973 and functioned in All India CGWB Employees Union under com A.B. 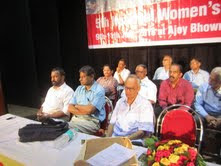 Bardhan, CPI, who was the founder president of this organisation. In 1978, this AICGWBE union is brought under the JCM scheme and renamed as All India Central Ground Water Board Employees Association. Com. N. Somaiah, former Secretary General of AICGWBEA and Vice-President of Confederation of CG employees and workers addressed. In his speech, he quoted the departmental issues which are pending since long i.e. outsourcing of drilling exploratory wells, amendments to Central Civil Service (RP rules 2008) and up gradation of workshop staffs/drilling staff etc. Com. Krishnan, Secretary General, Confederation of CG employees and workers, New Delhi delivered his speech and greeted for the success of the conference and also appealed to the delegates to take active part in the deliberation sessions with the meaningful debate and adopt appropriate resolutions. Com. 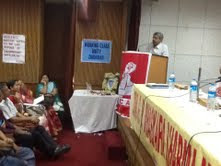 M. Krishnan, highlighted in this speech the role of confederation since 1957 demanding minimum wages for the workers and the success of 1961 and 1968 strikes. Com. M.Krishnan elaborately described that the neo–liberal economic policies of the Government in the last 20 years adversely affected the C.G. Employees resulting in extensive reduction of employees in major departments, i.e., in Railways from 17 lacs to 11 lacs, in Defence from 5.5 lacs to 3.5 lacs (including vacant post of 50,000) and also in other central government departments. Government is also keeping all the vacant posts without filling up thereby causing mental stress to the employees due to over workload and forced them to sit and work without specified working hours. He appreciated the role of AICGWBEA for the active participation in all the struggles including strikes called by the Confederation. The Second day (20th July 2013) Com. K.S. 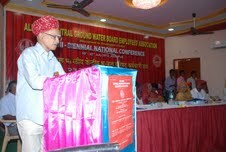 Madhusudhan, Secretary General presented the Conference report on the activities of AICGWBEA during the last 2 years. Discussions held on the report and resolutions were adopted on certain major issues. There after elections for the 2013 – 15 were held and the following office bearers were elected. Finance Secretary : Com. Shashi Ranjan Kumar. The undersigned is directed to state that the issue of revision of rates for reimbursement of medical expenses incurred on availing medical treatment in emergency conditions under CS (MA) Rules, 1944, when treatment is taken in a non-empanelled private hospital, has been under consideration of the Government for some time. 2. It has now been decided that, reimbursement of medical expenses incurred by a Central Government employee covered under CS(MA) Rules, 1944 on availing medical treatment for himself and his dependent family members in emergency conditions, would be allowed as per the prevailing non –NABH CGHS rates as applicable to a CGHS covered city and non-NABH rates applicable to the nearest CGHS covered city in case of non-CGHS city, as the case may be, or the actuals, whichever is less. 3. For the medical treatment in such cases where package rates are prescribed under CGHS, the non-NABH rates of the CGHS covered city and non-NABH rates of the nearest CGHS city (in case of non-CGHS covered city) or the actuals, whichever is less, will be applicable. 4. This OM supersedes all earlier orders issued from time to time under CS (MA) Rules, 1944 on this subject for allowing reimbursement of medical expenses in emergency conditions when treatment is taken in a non-empanelled private hospital. 5. This OM will come into effect from the date of issue. 6. This issue with the concurrence of the Integrated Finance Division vide their Dy. No. C-282, dated 22.05.2013. However, this year the facility for online filing of returns has been made user-friendly with the advantage of pre-filled return forms. These E-filed forms also get electronically processed at the central processing centre in a speedy manner. Hence, the exemption provided during the last two years is not being extended for assessment year 2013-14. Taxpayers are encouraged to file their returns electronically. E-filing is an easy, fast and secure method of filing of income tax return. Moreover, Digital signature is not mandatory for these taxpayers and they can transmit the data in the return electronically by downloading ITRs, or by online filing and thereafter submit the verification of the return in From ITR-V acknowledgement after signature to Central Processing Centre. Com. S. K. Vyas (Advisor), Com. K. K. N. Kutty (President), Com. M. S. Raja (Working President), Com. Giriraj Singh (Vice President), Com. M. Durai Pandian (Vice President), Com. N. Somaiah (Vice President), Com. M. Krishnan (Secretary General), Com. K. V. Jayaraj (Asst Secretary), Com. Pijush Roy (Asst. Secretary) Com. Ishwar Singh Dabas (Asst. Secretary), Com. Vrigu Bhattacharjee (Financial Secretary), Com. G. Mani Achari (Org. Secretary) Com. R. P. Singh (Org. Secretary) Com. Arup Chatterjee (Org. Secretary). Com. T. Narasimhan (Vice President), Com. B. Krishna Gaud (Asst. Secretary), Com. Nilesh D. Nasare (Org. Secretary) Com. P. Suresh (Org. Secretary) Com. V. Nageswara Rao (Org. Secretary), Com. T. Satyanarayana (Org. Secretary), Com. T. K. R. Pillai (Auditor). Com. Ashok B. Salunke (Vice President), Com. 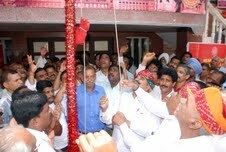 Ashok Kumar Kanojia (Org Secretary) Com. R. Seethalakshmi (Org. Secretary), Com. Y. Purohit (Org. Secretary). Before Commencement the meeting paid homage to Late Com. Samar Mukherjee, Ex-MP and Veteran Parliamentarian by observing two minutes silence. Com. S. K. Vyas, Advisor, in his opening remarks, explained the background of events which led to the formation of a Joint Council of Action of Railway (AIRF) Defence (AIDEF) and Confederation and also pointed out its weaknesses and limitations. He stressed the need to further strengthen the unity. He opined that on the 15 point charter of demands, Confederation must conduct its own independent campaign and agitational programmes. If the Railway and defence Federations come forward for serious agitational programmes including indefinite strike we must join such campaign and strike action. Com. 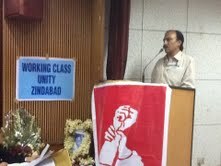 K. Raghavendran, Ex-Working President, Confederation also addressed the meeting. Thereafter discussion on all agenda items took place. Com. M. Krishnan, Secretary General made a brief presentation of the Conference proceedings, which was approved by the house after discussion. 2. 15 Pointes charter of demands and future course of action. 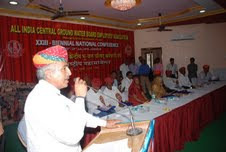 (i) To organize state level joint strike conventions of C-o-C with the participation of all affiliated unions/Associations/Federations during the month of August 2013. Whereever the C-O-C functioning is not satisfactory or has no participation of district units, efforts must be taken to revamp the committee. (ii) To organize mass Relay dharna at different places in all important stations during the first week of September 2013 (from 02.09.2013 to 07.09.2013). (iii)To conduct nationwide strike ballot during the last week of September 2013 (On 25, 26 and 27th September) Model of the ballot will be sent later. (iv)To convene the Central Working Committee/Central Executive committee meetings of all affiliated unions/Associations/Federations before the 1st week of October 2013. All India Office Bearers of the Confederation may be invited to attend the meeting. 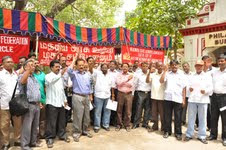 It was decided to make all out effort to further strengthen the Joint council of action (JCA) and also to launch serious agitational programmes culminating in indefinite strike before December 2013. It was decided to reorganize the COCs which are defunct or not functioning satisfactorily. This is to be done when the state level strike campaign conventions are organized. Participation of representatives of all affiliates should be ensured in the conventions. 5. 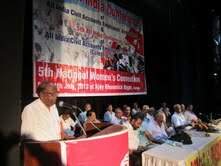 Conducting of All India Mahila Convention of the Confederation. 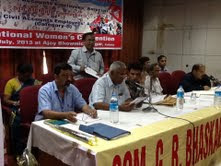 It was decided to conduct two day’s All India Mahila Convention at New Delhi in the 3rd week of October 2013. C-O-C Delhi has agreed to host the Mahila Convention. Delegate fee shall be Rs.600/- per delegate. 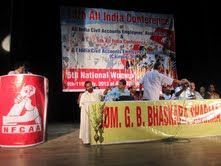 Participation of maximum number of Lady comrades from all states/affiliates should be ensured. 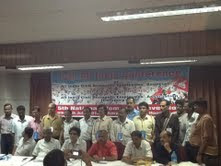 It was decided to hold the Trade Union Education Camp at Mumbai in November/December 2013. Number of participants shall be 150 (maximum). Delegate fee Rs. 600/- per delegate Postal, ITEF, Audit & Accounts and Atomic Energy delegates accommodation shall be arranged by their respective Federations. C-O-C Mumbai shall function as the Reception committee. Date and Venue will be intimated later. Decided to publish a monthly journal. Name of the journal shall be “CONFEDERATION NEWS” (subject to availability at RNI) Editorial Board shall consist of Com. S. K. Vyas (Advisor) Com. K. K. N. Kutty (President) Com. M. S. Raja (Working President) Com. M .Krishnan (Secretary General) com. K. P. Rajagopal (Secretary) and Com. Vrigu Bhattacharjee (Financial Secretary). Financial Secretary shall present the actual picture in the next meeting. Meanwhile letters should be sent to all affiliated unions to remit the arrears of quota immediately. A letter received from Secretary General, ITEF and the reply given, regarding the election of new office bearers of the Confederation was presented in the meeting by the Secretary General, Confederation. It was decided to send an appeal letter to the ITEF requesting them to resolve the issue amicably. The application for affiliation received from the following two organisations was considered and it is decided to grant affiliation subject to their accepting the terms & conditions for affiliation. (i) Indian School of Mines Karmachari Sangh, Dhanbad. 11. 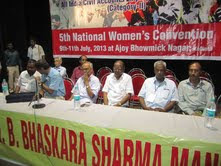 National Convention of Central Trade Unions on 6th August 2013. The available National Secretariat members/leaders at Delhi will attend the convention on 6th. President, Com. K. K. N. Kutty in his concluding remarks, briefed decisions taken in the meeting. The meeting ended at 5 PM. All office Bearers, State Committees, other C-O-Cs and Affiliated Unions/ Associations/ Federations are requested to implement the above mentioned decisions of the National Secretariat meeting, WITHOUT FAIL. 13th All India conference of All India Civil Accounts Employees Association (AICAEA), 5th All India Conference of All India Civil Accounts Employees Association category II (AICAEACAT II), and 5th National Convention of the Women Committee of National Federation of Civil Accounts Associations (NFCAA) were held jointly at Kolkata from 9th to11th July 2013. The Inaugural Session of above events held on 9th July from 10 a.m. in the Ashutosh Birth Centenary Hall, Kolkata was inaugurated by Com. Basudeb Acharia, Member of Parliament. Welcome address on behalf the Reception Committee for the Conferences and Women Convention was offered by Com. Sib Shankar Roy, Chairman. 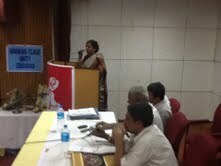 The session was addressed by Com. Pijush Roy, General Secretary, Co-ordination Committee of the Central Government Employees and workers Unions and Associations’ West Bengal, Com.A.B.Sunilkukar, President, All India Association of Pay and Accounts Officers (Civil) and Com. M.Duraipandian, President, All India Audit and Accounts Association. 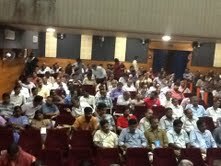 All ex-leaders of the Association who were available in the hall were honored and invited to seat on the Dias. The Open Session held at the same venue from 2 p.m. was inaugurated by Com. 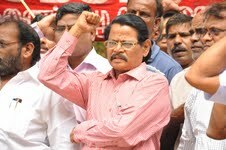 M. Krishnan, Secretary General, Confederation of Central Government Employees and Workers. In his one and a half hours long inaugural speech Com. 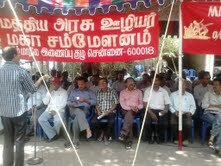 Krishnan narrated various issues concerning with the working class as a whole and explained the status and justification of some of important items listed in the 15 point charter of demands of the Confederation which includes the demands like - setting up of 7th CPC, merger of DA, scrapping the New Pension Scheme and removal of 5% cap in Compassionate appointments etc. 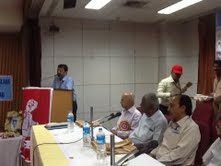 He also explained the steps taken by the Confederation to build up united movement with Railway Federations and All India Defence Employees Federation and asked the delegates to prepare for sustained struggle for the achievement of the 7 point Common Charter Of Demands adopted by these federations under the platform of JCA. Com.K.P.Rajgopal, Secretary General, Income Tax Employees Federation, Com. Giriraj Singh, All India RMS & MMS Employees Union Gr.C and Com. K. V. Jairaj, Secretary General, National Federation of Atomic Energy Employees also addressed the open Session. 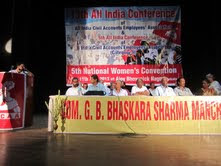 The Joint Delegate Session of AICAEA and AICAEACATII held on 10th July2013 in hall of I.C.M.A.R.D., Kolkata was inaugurated by Com.S.K.Vyas, Advisor, Confederation of Central Government Employees &Workers. Com. 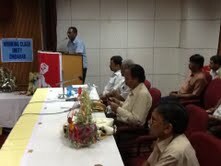 T. Satnarayana, General Secretary, All India Postal Accounts Employees Association also addressed the session. The Chief Guest of the Joint Delegate Session Shri Jawhar Thakur, Controller General of Accounts, Ministry of Finance, Department of Expenditure could not attend due to ill health. However, through a written message he offered his greetings to the delegates and assured his cull co-operation to AICAEA and AICAEACATII. 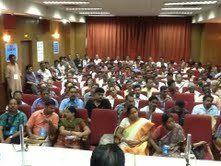 Veteran leaders and delegates retired during the period of last two years were felicitated by the Reception Committee in the joint Delegate session. 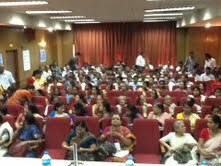 The 5th National Convention of National Women Committee was held at 2 p.m. at the same venue was inaugurated by Com.(Smt.) Malini Bhattacharjee, Ex-MP and National Executive Member of AIDWA. Com.(Smt.) Sumitra Goswami, ex-President of Co-ordination Committee of the Central Government Employees and workers Unions and Associations’ West Bengal greeted the participants in the Convention. A nine member Women Committee has been elected in the Convention with Com. (Smt.) L. Swaminathan as Chairperson and Com.(Smt.) Kalpana Dutta as Convener. The Delegate Sessions of both AICAEA and AICAEACAT II were held separately till 11th July 2013. Shri C. V. S. Prasad (ICAS), Controller of Accounts, Ministry of Mines attended the Joint Delegate Session on 11th July 2013 and greeted the delegates. 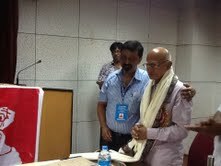 He was offered felicitation by the Reception Committee. Promote the causes of working class and take all efforts to strengthen the Confederation of Central Government Employees and Workers. Take initiative to develop stronger movement of Accounts and Audit Employees and Officers under the banner of JAC of Accounts and Audit employees and Officers and improve the tie of understanding between the employees and Officers organizations within Civil Accounts organization. Take all efforts to develop better employee-employer relations. Take steps to strengthen the organizational base by increasing the paid membership upto the level of 90% and place Secretary General of AICAEA to Foreign Service once again within December2013. Strive hard for the settlement of pending departmental demands including the demands of conversion of Civil Accounts as Department of Accounts, Allocation of seat(s) in Departmental/National Council, stoppage of appointment of retired employees as Consultant and cadre restructuring etc. Take initiative of organizing the Contingent/ Casual/ Contract employees working in the Civil Accounts Organization. Take steps for formation of an all India level organization of retired Civil Accounts Employees. A 17 member National Executive Committee has been elected by the 13th Conference of AICAEA. Com. K. Venkatasubramanian (Madurai) and Com. V. Bhattacharjee (Delhi) have been re-elected as President and Secretary General respectively. A 15 member National Executive Committee has been elected by the 5th Conference of AICAEA CATII. Com. A. K. Mehta (Delhi) and Com. G. K. Nair (Cochin) have been elected as President and Secretary General respectively. All Branches/Delegates/Central Headquarters congratulated and offered their thanks to the Branches of West Bengal and the Reception Committee for the elaborate and comfortable arrangements made by them to make the conferences and Women Convention successful. 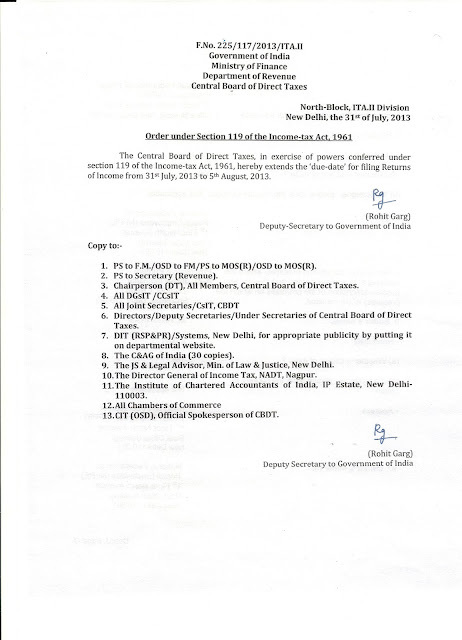 Department of Expenditure, Ministry of Finance vide its OM dated 09.07.2013 has approved the Indian Railway Catering & Tourism Corporation(IRCTC) as an authorized Agent for the purpose of booking air tickets on Official Tours / Leave Travel Concession (LTC). 3. March/demonstration before Parliament in the month of December during Parliament session. 4. In various sectors like Coal, Telecom, Banks & Insurance, Transport, Power, Port & Dock etc, joint struggles/strikes are being planned/undertaken by the respective federations. All support should be extended to those struggles. 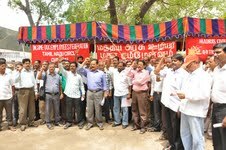 Central Trade Unions should also jointly endeavour to develop sectoral struggles in various sectors. Dates and details of programmes in September and December will be finalized through joint consultation of Central Trade Unions and announced from the National Convention. Today, is the 53rd anniversary of the Glorious Strike of the Central Government Employees which started on 11th July 1960 and continued for 5 days on the basic demands of the workers. That was their biggest strike in independent India till then, which shook the edifice of the Government. It was suppressed by all repressive measures putting thousands in jail, dismissal, termination etc. But the workers never surrendered. The mighty one day Token Strike on 19th September 1968 reminded the Government that the workers can never be suppressed all the times. On this day our Revolutionary salutes to all those comrades who sacrificed their lives at the altar of struggle and also who faced inhuman suppression and also the lakhs of workers who participated. Red Salute to all those who showed through their action that the united struggle is the right path. The retired employees became members of the scheme by paying from Rs 15,000 to 20,000. The members of the scheme also had given up their medical allowance of Rs 3,600. The Commission also directed that the facility for free treatment for the members of the health insurance scheme be made at the hospitals which are empanelled in the Ex-servicemen Contributory Health Scheme.